Bunday Slab is a slab family typeface created by Ralf Sander together with Petra Niedernolte and published by Buntype which is available in 3 different moods, 9 standard, 9 upright and 8 italic styles, a family of 26 styles. It has useful OpenType features and multilingual support. This legible and versatile font has clear and open base forms and makes it ideal for any kind of project such as advertising, branding, editorial, typographic use and so on. You cannot miss it! 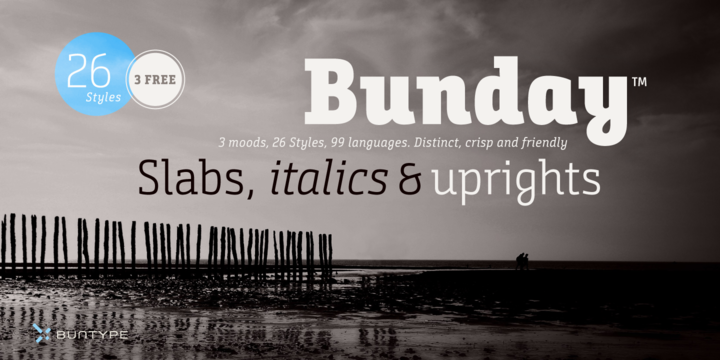 Note: “Bunday Slab” is a trademark of Buntype. Price: starting from $22,50 for one font to $145 for all 26 fonts. A font description published on Tuesday, May 23rd, 2017 in Buntype, Fonts, Petra Niedernolte, Ralf Sander by Alexandra that has 3,886 views.